The first thing you should know about Flatiron Construction is that the company is for sale. Royal BAM group, the Dutch parent company of Flatiron, said in an August news release that negotiations could lead to a sale by the end of the month. Royal BAM did not say who was interested in buying Flatiron. Flatiron's Chief Financial Officer Paul Driscoll says the sale should not have an impact on the construction of the I-35W bridge. Flatiron's sale will be the latest change for one of the largest bridge builders in the U.S. But the company didn't start out as a bridge builder. In fact, Flatiron focused on selling construction materials when it was first formed in the late 1940s. According to Driscoll, Flatiron "was mainly a sand and gravel, ready mix concrete for quite some time in the '50s and '60s and then it branched into construction and various types of construction." Driscoll and others say one project in the 1980s changed the company and provided Flatiron national recognition. Flatiron built many portions of the I-70 highway that snakes through the 12 mile Glenwood Canyon, a rugged stretch of country west of Vail, Colo.
Flatiron had to build tunnels and wrap the road along the canyon. In some instances, the westbound lanes rest directly above the eastbound lanes. After the work was finished, Flatiron won several design awards for building what is considered one of the most scenic highways in the country. "It changes the profile of our company to a company that does more complex projects and did launch us into a profile that allowed us to grow," Driscoll says. And grow it did. Since then, Flatiron has done major projects in Canada, California and several southern states. One of those projects was the Cooper River Bridge in Charleston, South Carolina. Flatiron was part of a team that built the $541 million bridge. Charles Dwyer, led the project for the South Carolina Department of Transportation. He said the project was finished one year ahead of schedule. "They weren't just doing things on the fly. They were planning ahead so they didn't have to step back and punt along the way and that really helped them meet that early completion date that they set for themselves." Several Colorado-based business reporters contacted by MPR News characterized Flatiron as a company that operates under the radar. Even with annual sales of $622 million, the company doesn't attract too much attention. MnDOT's reasons for selecting Flatiron for the I-35W project have not been made public. MnDOT will release the details of the proposal only after a contract is signed. Flatiron officials also declined to provide any detail on the design. Flatiron's proposal was the most expensive of the four. The company also had the longest timeline for completion. A team of six people rated Flatiron's proposal at 91 percent, nearly 25 points higher than the closest competitor. Jon Chiglo, the project manager for the rebuild of I-35W bridge, said at the public ceremony earlier this week that MnDOT considered a wide range of factors when judging the score. "We might pay a little more but we feel that when we do that we feel we'll get a better value based on the approach that these teams are taking. The approach of how they're managing quality, the approach of their design, the approach of the communications effort, the approach of the aesthetics value which are all important elements that have been identified in the last four to five weeks of public involvement." That score is now being protested by two of the losing bidders. 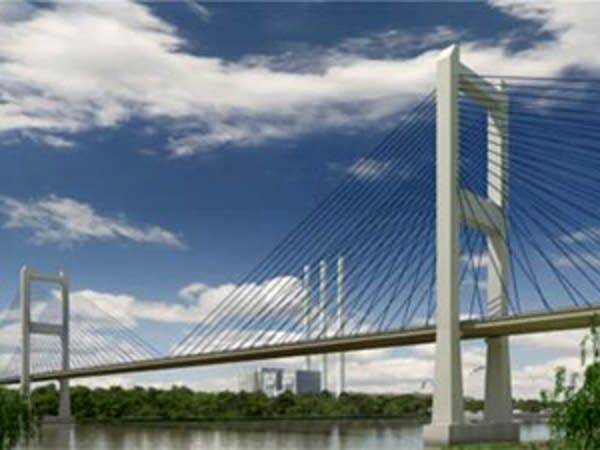 An attorney representing the regional contractors who bid on the project said in the protest letter that MnDOT misdirected them on the best approach to build the bridge. The attorney also complained that the criteria used to score the proposals was "arbitrary and capricious and not supported by any credible or substantial evidence." An official with MnDOT says the process was fair and they followed state law. MnDOT hopes to sign a contract with Flatiron by the end of the month and construction to begin on Oct. 15. Flatiron will be following an aggressive timeline to finish the bridge. They say they can finish the job in 14 months. This won't be Flatiron' first emergency project. Flatiron led a team that rebuilt Florida's Escambia Bay Bridge that was destroyed by Hurricane Ivan in 2004. Tommie Speights is a spokesman for the Florida Department of Transportation. He says Flatiron has met every deadline and is scheduled to finish the project in November. "They've kept their word. They've lived up to it. If they say they're going to do something then they do it." Flatiron officials say the I-35W bridge they build will be a safe bridge and the company always focuses on worker safety. Although, Flatiron has faced worker safety allegations in the past. California's Division of Occupational Safety and Health fined a team which included a Flatiron subsidiary for failing to disclose worker injuries on the Bay Bridge project. Those fines are being appealed. Flatiron's Paul Driscoll wouldn't comment on those allegations. But he said he would put their worker safety record against that of any company.